The song ended too quickly. “Can you play it again?” Theron asked anxiously. I nodded, happy he was so pleased. “As many times as you want,” I assured him and played it again and again. “I've never danced before.” His voice was slightly unsteady. I had watched him throw a knife with deadly accuracy into the flesh of an opponent with no hesitation, and now he was going to be nervous? I stood over him and offered my hand. He took it and got to his feet. I positioned myself about a ruler's length in front of him, then held my breath as I closed the gap. “You place your hands here.” I put both of his hands on my hips. “I like dancing already,” he said with a smile that filled even his eyes. “Don't be fresh,” I scolded playfully. Then I put both of my hands onto his shoulders. I smiled. I liked it too. “Now we sway.” I gently rocked us back and forth and moved my feet nice and slowly. He checked his stance and loosened up when he realized he had tensed. He looked into my face with an expression I couldn't name. Then he closed his eyes and sunk his fingers deeply into the muscles at my waist. The action took my breath away. Intensity. The expression on his face had been intensity. I closed my eyes, feeling it too, and involuntarily slipped my hands up onto the nape of his neck—my fingers tangled into his dark, loose hair. What are you doing? But the music continued to play, and I had been so broken—and obviously so had he. He was strong and overwhelming, and for this moment … just for this one moment, I wanted to allow myself to get lost in his arms, lost in his power. It was—just a song—just a moment. About A.J.M. Mousseau: I am an author and university student. I live in a recreational vehicle -- by choice -- with my awesome husband, four amazing kids, and huge, fluffy, 85 pound golden retriever named Titan. I write and do school on line as we travel throughout the U.S. and Canada. It is incredible to live in a new place every few months (sometimes weeks) and to see everything! 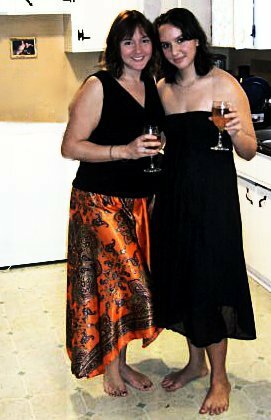 We have lived this clan and tribal lifestyle for two years now and have been to over twenty national parks and forests. They gave me a lot of inspiration for Freya's story. 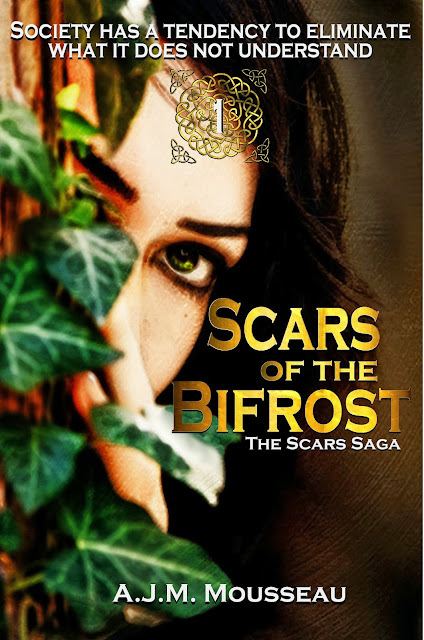 Thanks for featuring Scars of the Bifrost on your blog! I love your cover! Thank you for the info and giveaway! This doesn't sound too bad! I really enjoyed the excerpt, a lot. I think that I could enjoy this story. That definitely sounds awesome. Freya sounds like a great heroine, I can't wait to read her story. I really like the sound of this. What drew me in at first was the mention of the Bifrost since that is a term from Thor, so I was curious how that played a role in this book. This definitely sounds like my kind of book! Thanks for the spotlight and excerpt!